Synthetic peptide within Human CRTR1 aa 221-251 (internal sequence) conjugated to Keyhole Limpet Haemocyanin (KLH). The exact sequence is proprietary. WB: WiDr cell lysate and mouse stomach tissue lysate. 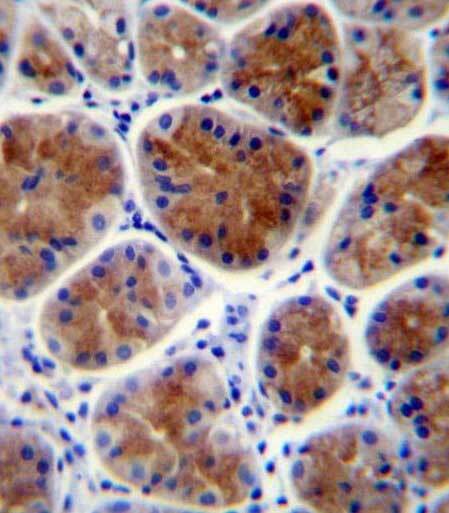 IHC-P: Human stomach tissue. Flow Cyt: WiDr cells. ab171839 is purified through a protein A column, followed by peptide affinity purification. Our Abpromise guarantee covers the use of ab171839 in the following tested applications. Transcriptional suppressor. May suppress UBP1-mediated transcriptional activation. Modulates the placental expression of CYP11A1. 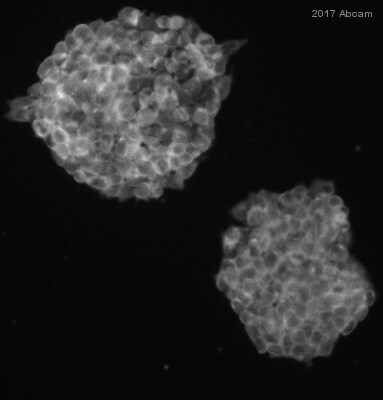 Highly expressed in placental JEG-3 cells and very low levels of expression in non-steroidogenic cells. No expression was seen in adrenal NCI-H295A cells or in adrenal tissue. Immunohistochemistry (Formalin/PFA-fixed paraffin-embedded sections) analysis of human stomach tissue labeling CRTR1 with ab171839. A peroxidase-conjugated anti-rabbit IgG was used as the secondary antibody, followed by DAB staining. 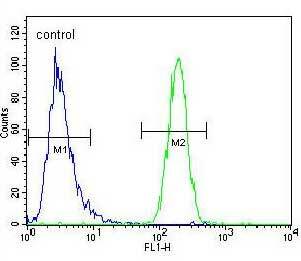 Flow cytometric analysis of WiDr cells (right histogram) compared to a negative control cell (left histogram) labeling CRTR1 with ab171839 at 1/10 dilution. FITC-conjugated goat-anti-rabbit secondary antibodies were used for the analysis. ab171839 has not yet been referenced specifically in any publications. Publishing research using ab171839? Please let us know so that we can cite the reference in this datasheet.